This work was created during the WoW/UNY Governors Island Residency. Lynn Neuman was in residence on Governors Island from June 25-July 8, 2015. Robin Michals was the photographer in residence on Governors Island. Artist Statement, Waste Side Story: The goal of Waste Side Story is to place a positive value on creative reuse and repurposing of materials, encouraging and supporting a change in the cultural ethos towards garbage, and to engage with waste as a process, a system of use, a point of interconnection and set of relationships. The project’s result is a series of commanding, beautiful photographs that reposition the concept of consumption and foregrounds the often invisible waste stream behind the average American lifestyle. 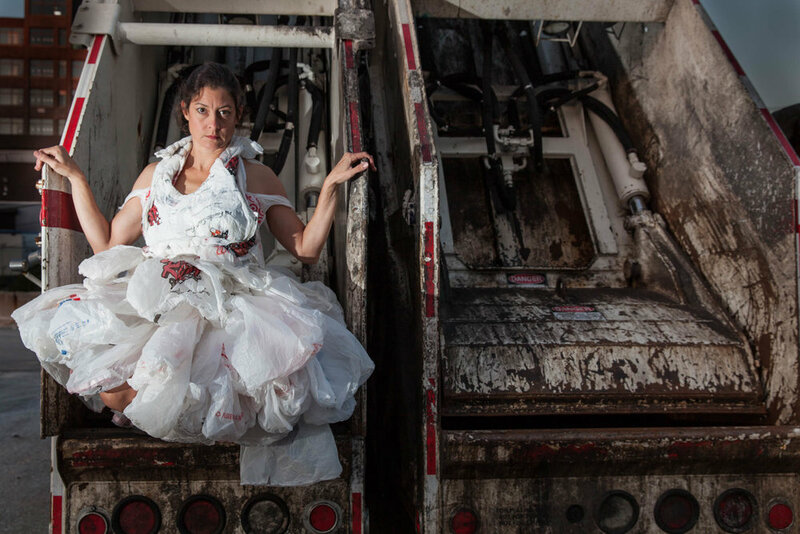 With sly humor and grace, these images, depicting a woman in the latest trashion (fashion made from trash) moving through the infrastructure of waste collection and disposal, questions the clean, neat surface of contemporary life. Shooting on location, such as waste transfer stations, scrap yards and recycling facilities, landfills, incinerators and wastewater treatment plants, is essential to the visual power and impact of this work. Artist Statement, Robin Michals: I first photographed Lynn working in her studio at 5B making a costume for a dance performance from plastic bags by ironing them together. I was struck by how this was both a creative reuse of this ubiquitous material and a visually striking way to bring attention to single use plastics. She suggested that I also take some photos of her wearing one of the costumes. She put on this amazing Rei Kawakubo-style dress made from plastic bags stamped with “Thank You” that had a long train. We decided to shoot by the fence that runs along the waterfront. In a moment of good fortune, a wake crashed behind Lynn, splashing high as she stood against the fence, highlighting the shape of the dress. The water droplets added that extra something to the photo, making clear how the location could add meaning to the costume. As a proof of concept, we shot in the parking area of the Sunset Park Sanitation Depot in September. We are now planning the series Waste Side Story in which we will create photographs of Lynn in costume moving through locations where the waste stream is processed to create compelling images that foreground what it takes to support current levels of consumption. Lynn Neuman is a performer, choreographer, teacher, producer and Director of Artichoke Dance Company. She pursues art’s intersection with daily life and addresses pressing ecological realities with physicality and wit. Lynn was a 2016/17 Association of Performing Arts Presenters Leadership Fellow and is the first choreographer to be awarded a Marion International Fellowship for the Visual and Performing Arts (2015/16). She has been commissioned to create work by Dixon Place, Joffrey Ballet School, Brooklyn Arts Council, DUMBO Development District, The Soraya, and higher education institutes across the country. As an educator and presenter, she is highly regarded and sought after for her work in community engagement and the merging of arts and environmentalism. Lynn believes in the power of the arts to effect positive change in people’s lives and communities. To this end, she works with a variety of populations promoting cultural literacy by engaging people in dance experiences. Find more about Robin Michals at e-arcades.com.